There is one problem that surpasses all others in its impact on men, women, and society. It is the family father wound. This book focuses on the importance of mothers in determining the well-being of children. Yet, without the support of their fathers, men become disconnected from their true selves, feeling that others are controlling their lives. The family father wound may be the most pervasive, most important, and least recognized problem facing men and their families today. The male anger and rage we see in everything from domestic violence to school shootings very possibly has its roots in trauma resulting from growing up in families with disconnected and dysfunctional fathers. Yet, this childhood wounding can be healed. 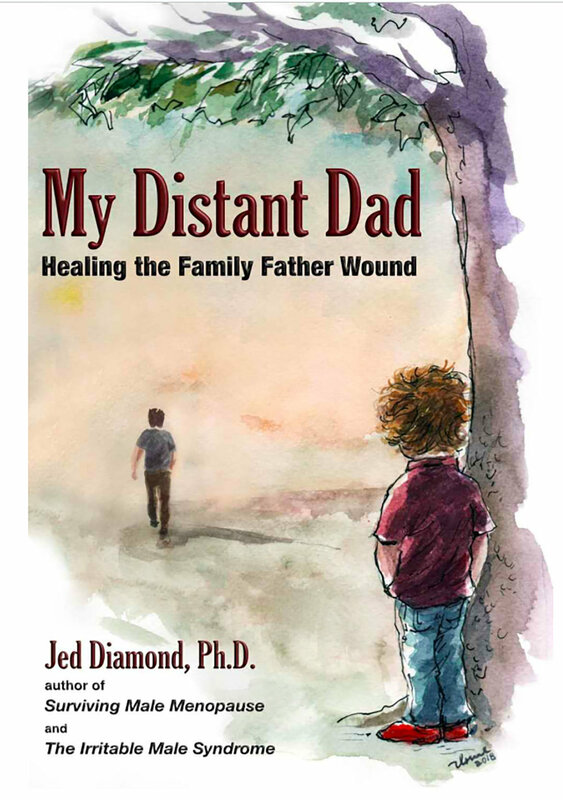 This 15th book by Dr. Jed Diamond, My Distant Dad: Healing the Family Father Wound, is an adventure story to find the father he lost when he was five years old. It’s also a tale of redemption and healing for both father and son. The trauma of growing up with an absent father contributed to the author’s own bouts of depression, sexual addiction, and destructive relationships. For the first time, he shares the raw, personal, life experiences and his own healing journey. Learning about his mother’s lost father, who died when she was five years old, helped him understand that the father wound impacts women as well as men. Healing inter-generational wounds put him on the path of becoming a psychotherapist who has been helping men and the families who love them, healing his clients as he has learned to heal himself. As a psychotherapist who has treated more than 30,000 men and women over a long career, Jed has seen the devastating impact absent fathers can have on the lives of their children and how this wounding causes problems at all stages of life. Boys and girls who experience the father wound often become adults who unknowingly wound their own children. Once he recognized and understood the prevalence and importance of the father wound, he was able to help people recover from problems that had previously been resistant to both medical and psychological interventions. For fifty years Jed as been helping men and the women who love them. During that time, he’s become one of the world’s leading experts on men’s issues and has written a number of trend-setting books including Looking for Love in All the Wrong: Overcoming Romantic and Sexual Addictions (G.P. Putnam’s Sons, 1988), Male Menopause (Sourcebooks, 1997), and The Irritable Male Syndrome: Managing the 4 Key Causes of Depression and Aggression (Rodale, 2004). My Distant Dad: Healing the Family Father Wound is the first book to address the father wound and its impact on men and women through the personal experiences of a world-renowned expert on men’s health. Jed’s insights and introspections are incredibly profound. For anyone who’s ever experienced struggles in your love life, worries about money and success, or allowed male anger and resentment to negatively influence your life, this book can change your life in dramatic and positive ways. Click here for more information about My Distant Dad. JED DIAMOND, PhD, LCSW, has been helping men, and the women who love them, for over 40 years. He is the Founder/Director of MenAlive, a health program helping men live long and well. Since its inception in 1992, Jed has been on the Board of Advisors of the Men's Health Network. He is also a member of the Association for Comprehensive Energy Psychology (ACEP), the International Society for the Study of the Aging Male and serves as a member of the International Scientific Board of the World Congress on Gender and Men's Health. His work has been featured in major newspapers throughout the United States including the New York Times, Boston Globe, Wall Street Journal, The Los Angeles Times, and USA Today. He has been featured on more than 1,000 radio and T.V. programs including The View with Barbara Walters, Good Morning America, Today Show, CNN-360 with Anderson Cooper, CNN with Glenn Beck, CBS, NBC, and Fox News, and To Tell the Truth. He also did a nationally televised special on Male Menopause for PBS. Jed lives with his wife, Carlin, on Shimmins Ridge, above Bloody Run Creek, in Northern California. They are proud parents of five grown children and twelve grandchildren. Click here to visit MenAlive. Older Post"At Death Do Us Part"